Jay is an experienced executive benefits consultant and has worked in the financial services industry since 1988. He specializes in the design, implementation, financing and ongoing administrative support of supplemental executive retirement plans specifically tailored to credit unions. He has served in various capacities with CUNA Mutual Group, Members United Corporate Credit Union, Pentagon Federal Credit Union, Point Loma Credit Union and San Diego County Credit Union. Jay’s experience includes time served as an Executive Benefits Specialist and a National Accounts Executive as well as President of Pentagon Federal Financial Services, Manager of Point Loma Services and an internal auditor. 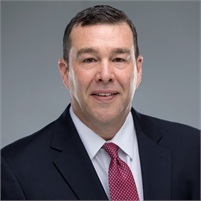 His specialties include Executive Benefits, institutional investments and balance sheet analytics, retail investment and insurance CUSO/program management and internal audit. Jay earned a BBA with an accounting major from Iowa State University. He is FINRA securities registered with a series 7,24,63 and 65 and holds life, health and variable life insurance licenses. He resides in Carlsbad CA with his wife and two children.